I get weekly requests from readers to write a guide on teaching children to help with laundry or completely take over the laundry situation in their own homes. I have a ton of ideas and suggestions to write about, but haven’t yet found the time to put it into a polished format. If old enough, have your children be responsible for getting their clothes laundry room ready before putting them in the dirty hamper. What is Laundry Room Ready? I use this phrase with my family a lot. While I appreciate my 6 year old’s effort to get his clothes into the dirty hamper, they are often turned inside out and balled up. 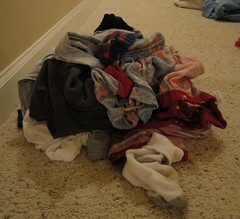 Inside out shorts, balled up socks and 2 t-shirts inside of each other are not Laundry Room Ready. The only exception to this is if it has a printed image on the front of the shirt. No double t-shirts where one is still inside of the other or double pants, such as snow pants with jeans tucked inside. It’s really not hard to make something Laundry Room Ready. And teaching it to your kiddos? Or spouse? While it’s not difficult, it does require many (patient) reminders. So if you are the CLO (Chief Laundry Officer) in your home, how does this benefit you? It makes your job much easier – no more taking the time to turn shirts right-side out, no more un-balling socks, and no more separating double t-shirts (or snow pants or t-shirts/sweatshirts or other double-layer items). While these tasks are certainly not rocket-science, they can be fairly time consuming. In my son’s pile of clothes above, it would have taken me several minutes to get everything turned. Multiply that stack times 4 children and I’ve wasted over 5 minutes just getting clothes ready to put in the washing machine. Believe me, I don’t have 5 minutes to waste during the day. And if I did, it would be on Pinterest. Just sayin. Any way that you can streamline your laundry routine is worth it. While balled up soccer socks need attention, there are things that are much more worthy of your time and attention in life. So make your Laundry Life as simple as possible so you can enjoy what you choose to enjoy – not what demands your immediate attention. Haha! I told my kids – just yesterday! – that undies must be pulled out of pants/shorts/jeans and socks must not be balled up. I actually prefer shirts right side out so I can check for spots that need to be treated, then I turn them inside out if needed (but to each their own, right?). Off to follow you on Pinterest! Great reminder,especially w/colder weather heading our way. My husband is the worst offender when it comes to leaving layers in his clothes. I hate having to stop & pull shirts out of sweat shirts & sweaters. As you said it is not the worst problem,but it is time consuming. As for the way clothes are turned, I prefer them to be right side out,so I can check for stains. Once I pretreat the stain,I turn them inside out & launder. My husband stills leaves his dirty socks in a ball after 10 years of marriage. Oh well. My husband just told me that I can’t make my kids do this unless I do it too! LOL!! !